after a break from sketchy sunday to support our family through difficult times, here we're back with the sketch theme "air". if you have sketched anything else in the past weeks (no matter which subject), you can share these sketches here as well, just include your additional theme in the description line when you link up! every sunday the artsy ants will publish a theme which is to be sketched during the following week. you can take that theme literally, or you can let it spark your creativity, develop that topic, and see where it leads you. the following sunday, come back and link up your sketches for all to see. you can link up your specific blog post, flickr upload, etc. the link collection will be open all week long in case you're not yet ready to link up today. see at the end of this post what the new theme of the week will be! 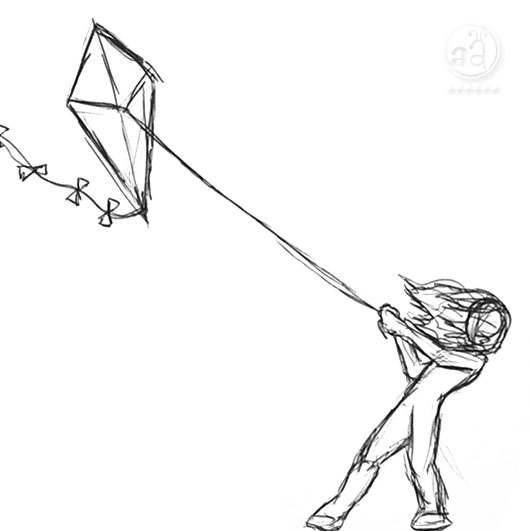 awesome, i'd love to fly a kite again soon! I read the title and thought "how do you draw air?" and then you did! Love it!! Hi Ladies, So nice to see you back with Sketchy Sunday! I posted the link above a while back before I realized that you were taking a break. Thanks so much for coming up with such creative themes! fall craft tutorial: make a chestnut worm! © 2010-2014 by artsy ants - do not copy or publish any content without written permission. Powered by Blogger.